The weirdest things popping up in the most unexpected places are really why I travel. I don’t quite know why I was surprised to find this establishment, because it was less than 2 blocks away from the local Baha’i meeting place which was also advertised in Quechua. For those who don’t speak any Hawaiian, “Mahalo” means “thank you” in that beautifully rippling Polynesian language. 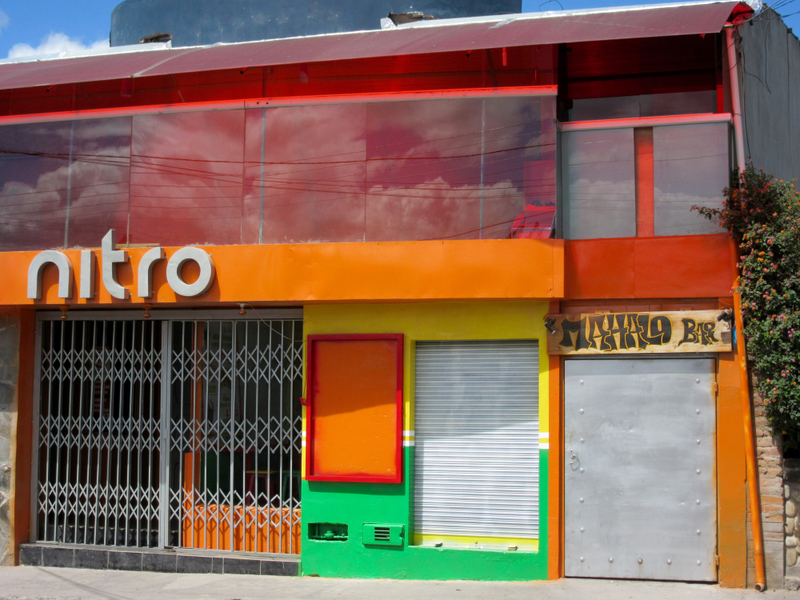 This bar, closed during the day, is on a main street here in Otavalo. Mahalo indeed. It’s one thing to see the word mahalo in Waikiki, where you see it everywhere including on all the trash cans (of which there are countless, thank you City of Honolulu!). Yet that in itself can be a problem. So many tourists have seen it on the trash cans that many have come to believe that it means trash. So when, for example, a local cashier receives payment tendered and replies “Mahalo,” that Ugliest of Americans takes insult and escalates the misunderstanding further by behaving even more stupidly, thinking that they’ve just been called garbage. Jeez, mahalo nui loa, bubba. 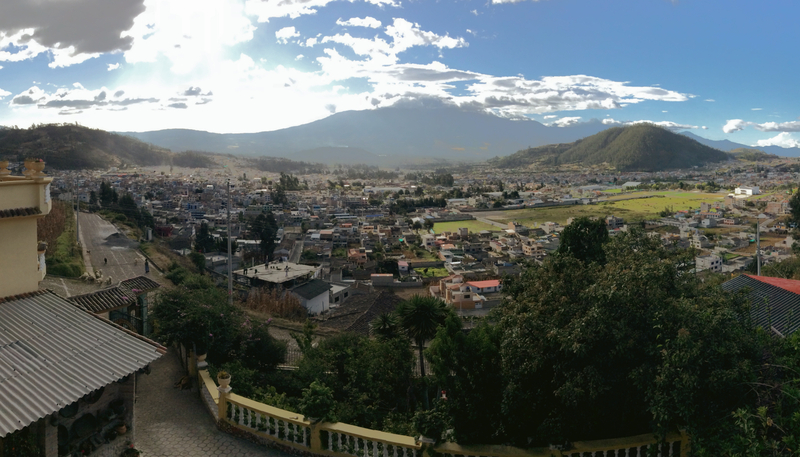 With that rant out of the way I can say that I arrived in Otavalo yesterday. I came to witness Inti-Raymi, the most important Ketchwa (there are nearly a dozen ways to spell this word, so don’t wait for any consistency from me) celebration of the year. Otavalo is the largest indigenous city in Ecuador. And Inti-Raymi pays respect to summer solstice, though please do not ask me how they can tell, being less than 100 miles from the Equator (equal days, equal nights, remember?). But it’s been celebrated for millennia so someone’s been keeping watch. This morning I greeted sunrise by keeping up my Tai Chi practice here on the roof deck of the Hostal Curiñan (if you visit Otavalo, stay here, period!). Sure, it was sublime: watching the sun behind me lighting up the mountains across the valley, hearing the sheep and goats grazing across the road from the hostal, but it also was a time of revelation: I had made a mistake. A month previous, having just returned from living with 2 shaman families in Marona Santiago and having received 2 serious visions via drinking Natem/ayahuasca, I had to start living my truths as revealed. And the second of the visions, the one that told me that my time in Quito was over, led to making this reservation at the hostal. Now the mistake was not staying at the hostal, since it is a piece of heaven in a heavenly place, nor was it in coming to Otavalo for Inti-Raymi, as I’m by now an exposed indigenous junkie. I need to be here, really. It’s not my fault. No, the mistake was making the reservation for only 10 days. I don’t see how I can apprehend what I’m feeling all around me in such a short period of time. I know many people think that they can tour Europe in 10 days, but there’s no way I’m going to leave here in just a week and a half. The rest of Ecuador will simply have to wait. And while you re-read the article therein linked, pay attention this time to the spirituality reference. Heaven really is where you find it. Returning, somewhat, to Otavalo I can say that I’ve hated lantana since I first came to Hawai’i in the late 60’s. Back then I joined the Hawai’i Trail and Mountain Club and spent every weekend hiking mountain trails on O’ahu and also among the Outer Islands. Yet so many trails beginning in or near Honolulu were plagued with the wild overgrowth of this decorative little thornbush which raked my ankles and shins, leaving me criss-crossed with bloody scars (wear long pants? in Hawai’i?). Back then I read that it was introduced to the islands from a nursery in Cleveland some time in the 1890’s. Sometime later it somehow escaped someone’s garden. Thanks Cleveland. I was born 40 miles south of the “Metropolis of the Western Reserve,” the home of the Cavaliers and the returned LeBron James, so it took some time to get over my resentment of Cleveland. Being, as I was, from Akron, we were always 2nd-class to our big brother, the “BigC.” I’m glad that I did get over it though, because I have learned to love the lantana in Ecuador. It’s a decorative bush or even a small tree in many yards in Quito. And here in Otavalo I just returned from the University of Otavalo campus where there is a lantana hedge several blocks long and in full bloom with tiny red and yellow flower clusters. Thanks you jardineros at U of O! I was following a train of thought here; oh yes: Otavalo. What put the city on the map many years back is that it hosts the largest open-air market in South America (I haven’t personally verified this, but then paid journalists no longer verify either, listening Fox News?, so blame wikipedia). I’ve also heard that the Otavaleños are the most prosperous indigenous group in SA as well. Now for that piece of info you won’t get an argument from me. With the steroidal 4dr pick-ups cruising town and the casas grandes sprinkled throughout the barrios, it is easily evident that money has been made here and continues to be made. Each Saturday the place is awash with cash-heavy tourists more than willing to trade their dinero for some of the best textiles, weavings, wood carvings, leather goods, “panama hats” (you get the picture) that one can hope to find anywhere. This stuff for sale isn’t junk either, though with some judicious bargaining one can certainly return home with quality artisanal products at far better than store-bought prices. Needless to say, these folks know how to do business. They’re indigenous, truly, but they’re not primitive. Wait though, that’s not enough for these gentle but focused hosts. Right across the road and uphill a bit they are building a bigger hotel! It will open in 6 months or so and will probably be just as ably run. However, if I return I’ll stick with this smaller version and it’s stunning views. You might have realized that after 5 months of living in Quito, I’m hyped and on a roll, with thoughts, encounters, and possibilities racing through my little mind. It’s going to take several installments to explain the magic of Otavalo and the surrounding Imbabura Province. Please come back for more and I might infect you too with the wonder that’s all around me. This Sunday night I’ve been invited by my hosts to take part in the Inti-Raymi ritual of midnight cleansing under a 60’ waterfall. Now that’s going to be cool, up here in the mountains. This entry was posted in Indigenous, Otavalo, Quechua and tagged ayahuasca, Ecuador, health, indigenous, Inti-Raymi, Kichwa, Morona Santiago, Natem, Otavalo, Quechua, Quito, Shuar, spirit world on 2015-06-17 by kmalivuk. In a very linear way. Tomorrow is your birthday. So have a happy one. …mahlo for your postings. Hey Rick, I do believe that you have a point there. Thanks for the salutations. I expect to be in the middle of these New Year’s doings and will co-mingle both observations. Right now I’m on my way to the Condor Bird Park for an eyeful of really big birds. Love to the Florida clan and also now Val’s new contribution: Elliot Grace! Well, I don’t understand. Emojis aren’t enough for you? You actually want to construct a real sentence? Isn’t that somewhat communistical? Thanks for the thoughts. Tomorrow the city is having a parade. I wanted to tell them that it wasn’t necessary but they seemed insulted when I said it. Go figure.